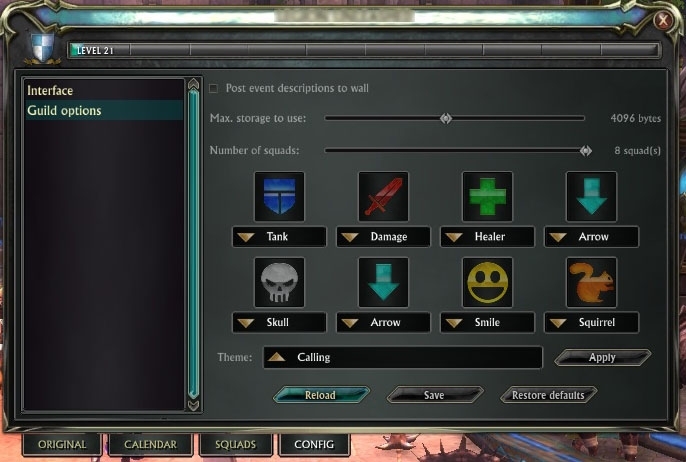 Note: Guild officers should use the 'change' button to add themselves to events. 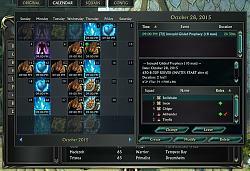 Alts that are in guilds which do not use the BiSCal will cause instability. If you're checking an alt that is in a guild without BiSCal configured, please disable the addon before loading that alt. The UI Overhaul for 3.4.3 has broken Rift's Native Window sizing access for most people. The current version has a work around in place for that, but hasn't been drastically altered. If the current layout issue remains after the next patch, we'll come up with a more long term solution. 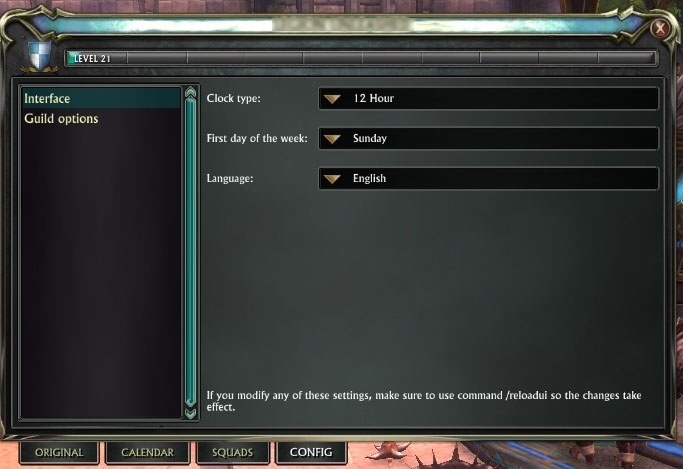 - Updated layout so that the calendar window will have size and place even when the native window does not recognize it's own size. Look for the tabs up top center when that happens. - Updated Yague embedded version to one that doesn't crash the game! 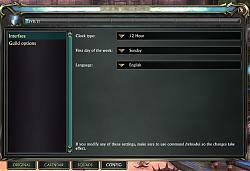 - increased time version checks are made. - more tweaks to the messaging system for addon communication! - update french locale.. Thanks for the help! - Fixed bug when version checking sometimes occured more often than it should, also made some minor adjustsments to allow for the below addition! - Addon messaging now relays your class throughout guild members, which will only be used to add new features in the new feature. - added russion locale big thank you goes out to Иван Бакуров for doing the work!!! - Added dirty /biscal reset command so guilds can uninstall BiSCal stuff from their guild storage. 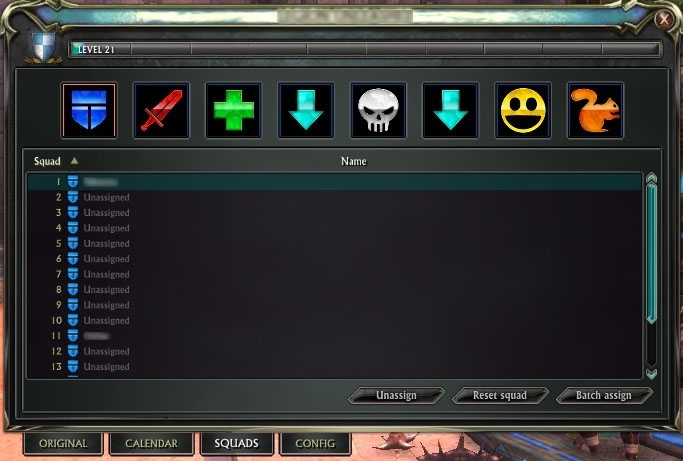 - Added "Batch assign" and "Reset squad" features under the Squads tab. - removed need for SafesUnitLib. VersionCheck.lua is completely self sufficient! - much optimization needed still.. considering dropping it as a module, getting revision via cf instead.. but it works for the time being.. ill continue to fix throughout today! - Update list of event types available. All chocolate rift events should be listed. Still need to add All dungeons though! - WIP but should be functional version check in place with localization already done for it. it needs to be a recoded a bit but almost done. 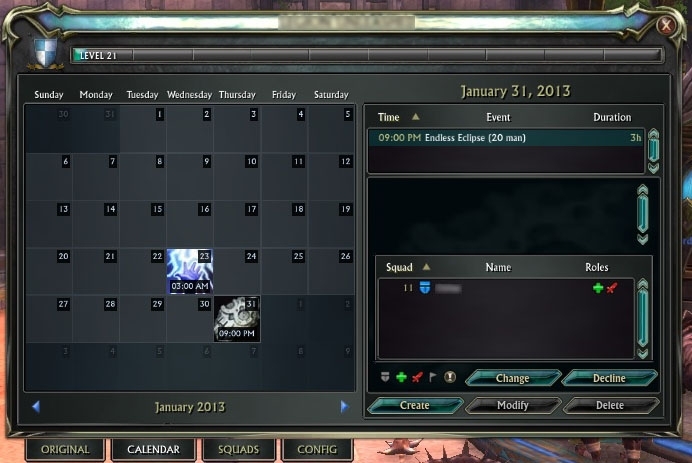 There also appears to be an earlier version just called BisCal not Bis Calendar. I think they are not the same. I used BisCal before but have not used this new one so I think I'll go back to the other one since I did not have any issues with it. That website is old and has been gone for a while. I've removed the link. The forums here are the best way to get feedback/post issues. Not sure why but I had to disable this addon just to get into game after the 2.4 patch. Otherwise I would get stuck in a crash loop for about 8+ crashes, highest amount of crashes was 23 times before I just said fck it. There was a bug on the 0.5.134 version that caused that. It should be gone on 0.5.136. 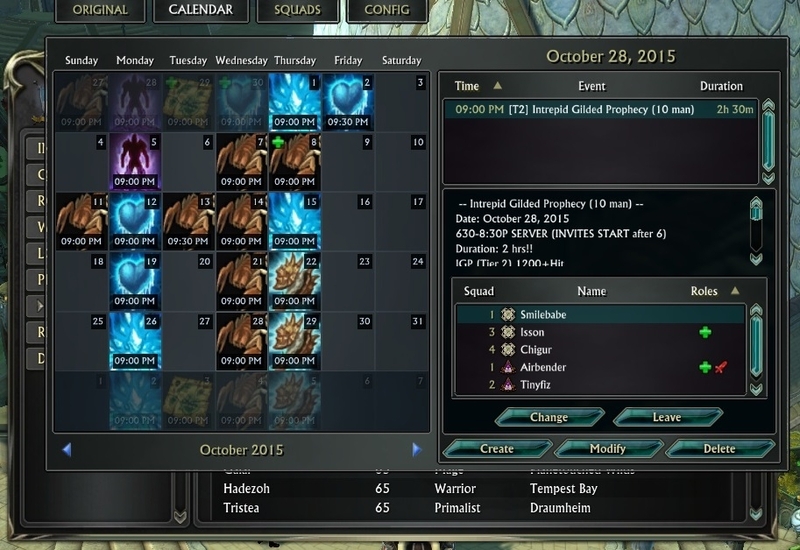 Is it possible for two guilds to share the same calender? When I type a note into the event it will not stay. Does not show up in the event nor in the box when I reopen it. I have full access to all guild functions. any suggestions as to what I am doing wrong would be appreciated. Very nifty tool you got there! I'm the author of Tsuk UI and I was wondering if I could include your addon in the package? I will not include the addon in my download itself, but I will implement it. So people still have to download the addon from your page, but will get my saved settings only. 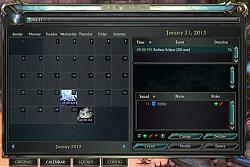 Last edited by Tsukiyo : 06-24-13 at 01:28 PM. what a tool.. impressive addon. You've done nice works. May be I miss something, but I don't find anyway to "automatically group people with one clic (I don't even know if it is possible on rift with actual LUA functions). Whatever, it's a really impressive addon. For me, it should be implemented into rift as a standard. API for rift does not allow us to mass invite people from an event yet. If it ever becomes available it will be in this addon no worries! I can suggest you an auto invite when you double click on the character on the list, it will be a good alternative (sorry for bad english). Might consider something like that down the road. 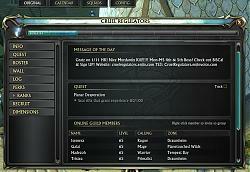 Or maybe some API assistance comes along with something like that for at least guild members. In order to even invite one member at a time that entire UI CHAIN OF FRAMES has to be secureMode.. Thanks for the suggestion and its not its not something we dont want to do, but we do have alot incoming features as well. Recent update added maintance options so that you can clear expired events easier, etc etc.. Next update hopefully will clear up the standby situation. its getting its own button apart from roles so its not to be mixed up by a role! Last edited by Sevino : 02-04-13 at 01:11 AM. Just wanted to say, this Add-on is amazingly well done. 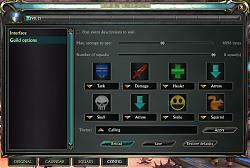 And very useful, one of those things that I cant believe has not been made into the default UI by Trion. 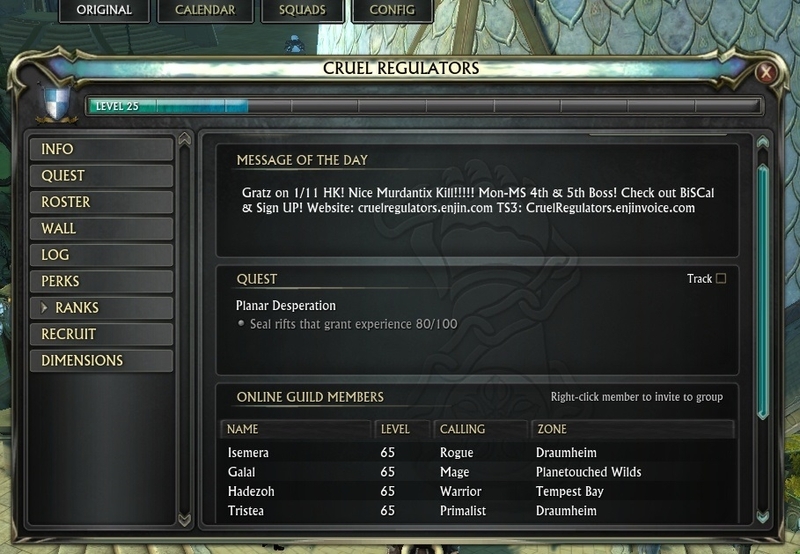 I really hope this addon becomes a standard for guilds.